Bonito is the ecotourism capital of Brazil and lies approximately 3h drive from borders with Paraguay and Bolivia, in the state of Matto Grosso, Brazil. Natural attractions Bonito has to offer includes crystal clear rivers, beautiful caves and untouched forest so there is no wonder Bonito is a popular destination for many Brazilians. And not the cheapest destinations! Snorkeling is one of the most popular activities in Bonito. There are 9 providers of river snorkeling tours being located on different rivers or part of rivers, having as well different prices. We asked at our hostel, which price-performance provider they would recommend and the answer was to go with Barra do Sucuri, but honestly, I think that whichever you choose it will be a great experience. Check all the providers and prices here. When we arrived at Barra do Sucuri, surprisingly, there was nobody speaking English, so I was a bit worried about how the snorkeling will go, as I never done it before. We got the masque and neoprene and somehow, our guide managed to explain to us how to use it with his broken mixture of English, Portuguese and body demonstration. After a test dive, to try how to breathe (and tasting the water in my case), there was no other excuse not to get to the water full of fish. But first, we had to paddle against the stream to get to the start point – quite an exercise. The thing about snorkeling in Bonito is, that the whole region belongs to the natural reservation and they are very strict about preserving the environment, so basically, the snorkeling is just floating on the water (that’s actually also how they call it – fluctacao). You can only move your hands to move to left and right, you are not allowed to stand or swim with your legs and you should just let the water carry you while enjoying the view of river life. Sounds pretty awesome, doesn’t it? It is great and peaceful activity, but one negative about not being allowed to move – I got cold very fast. In the end, I was hiding my hands under my armpits to warm them up a little bit and when we got out, I was shaking for another hour. 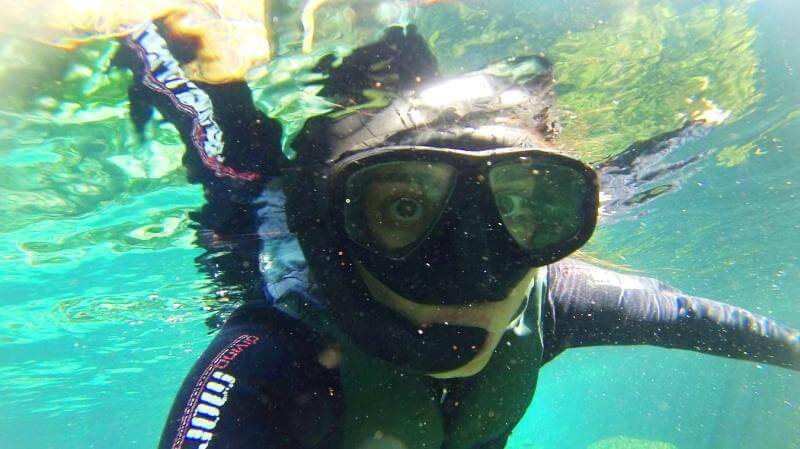 Snorkeling in Brazil in the winter? We visited Bonito in June, which is the beginning of winter, it was quite warm during the day, warm enough to swim in the natural lakes or hotel pools and warm enough to survive one hour of snorkeling in the river. So, the answer is yes, you can go river snorkeling in the winter. The advantage of the wintertime is also the lack of tourists, meaning also lower prices and possibility to book just one day in advance.